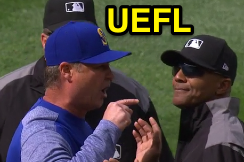 1B Umpire CB Bucknor ejected Mariners Manager Scott Servais (fair vs foul ball call) in the bottom of the 6th inning of the Rangers-Mariners game. With two out and one on, Mariners batter Leonys Martin hit a 0-0 cutter from Rangers pitcher Tony Barnette on the ground and along the right field foul line to first baseman Mike Napoli, who fielded the grounder and stepped on first base to retire Martin, who hadn't left the home plate area. Replays indicate the batted ball bounded directly over first base, in fair territory, and did not appear to strike Martin in the batter's box (properly no-called by HP Umpire Mark Carlson), the call was correct. At the time of the ejection, the Rangers were leading, 6-5. The Mariners ultimately won the contest, 8-7. This is CB Bucknor (54)'s first ejection of the 2017 MLB regular season. CB Bucknor now has 4 points in the UEFL Standings (0 Previous + 2 MLB + 2 Correct Call = 4). This is the sixth ejection report of 2017. This is the 4th Manager ejection of 2017. This is Seattle's 1st ejection of 2017, 1st in the AL West (SEA 1; HOU, LAA, OAK, TEX 0). This is Scott Servais' first ejection since June 26, 2016 (Carlos Torres; QOC = Y [Check Swing]). This is CB Bucknor's first ejection since May 4, 2016 (Eric Hosmer; QOC = N [Balls/Strikes]). Wrap: Texas Rangers vs. Seattle Mariners, 4/16/17 | Video via "Read More"